Kevin Mirallas was substituted at half-time in Everton's 0-0 draw with West Brom because of injury rather than his penalty miss, Roberto Martinez says. 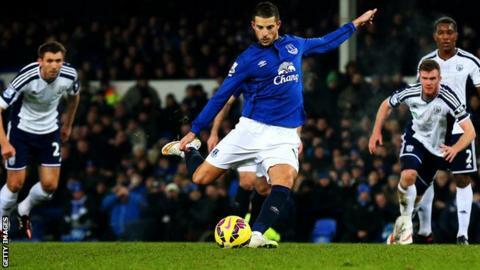 Left-back Leighton Baines is Everton's regular penalty-taker, but ceded spot-kick duties to Mirallas and the Belgium winger struck the outside of the post. "Kevin felt his hamstring was getting sensitive. It was a precaution," the Everton boss told BBC Radio 5 live. "They are not related. The talking point is because we missed it." Martinez says Baines did not have a problem with Mirallas, who converted from the spot in Everton's penalty shootout defeat by West Ham in the FA Cup last week, taking the kick instead of him. "Normally Leighton takes the penalties but we have a few players in the squad capable of taking them," Martinez added. "Leighton was quite happy to let him take it because he felt confident and right in that moment. "There is no big issue in that. It became an issue because he couldn't find the back of the net." However England assistant manager Gary Neville, covering the game for Sky Sports, disagreed. "What he's done there at 0-0, taking it off the major penalty taker, which is what it looks like has happened, is a despicable breach of team spirit," Neville said. "To go against team orders, you do not do that." Meanwhile, Gary Brabin has left his role as manager of Conference side Southport to join Everton's coaching staff. The 44-year-old began a second spell in charge of the Sandgrounders in October 2014 and guided them to the third round of the FA Cup this season, where they were beaten 1-0 by Derby County.